Hello everyone! Ahh, I'm so excited to finally have a bit of vacation time. I'm gonna spend some quality time with family and just relax. It's going to be awesome. :D One thing I'm planning on doing is seeing Avatar again. I saw the midnight opening last week but it was soooo beautiful that I want to go back and see it in 3D IMAX! Have any of you seen it yet? The good news is that I will now be sponsored by Pinky Paradise to provide lots of lens reviews in the future! Pinky Paradise is a Malaysian-based lens company so lenses travel slightly farther to get here to the US but I was given tracking info and it actually didn't take much longer at all. I received 3 pairs of lenses (2 of which I will be posting about in my next entries: Adult Violet and Big DM32) along with cute animal cases for each lens and a collagen eye mask. They send the animal cases and collagen mask as freebies with every order. Here is my video review of the first of the 3 lenses, Dueba MX21 Celeb Brown (14.5mm). It was my favorite of the lenses I got and the first I tried on. My first impression was wow, pretty! The brown color shows up really nice and bright in real life (like in the video) and it's a natural color so it doesn't look too crazy. In fact, it's my favorite brown lens I've tried and I've previously owned Vassen brown, Adult brown, G&G bt02 brown, and Pacifica honey. I do love my Adult browns but I don't even know if I consider them brown, more like brown-grey like Solotica ocre. 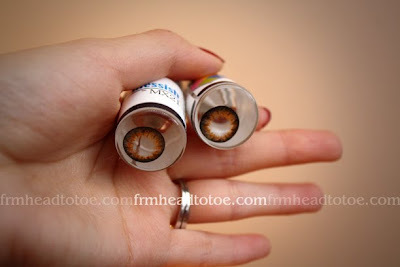 MX21 Celeb brown (14.5mm) is a true brown honey color, not too grey or orange. How they look on me, with my new Canon XSi! Oh man, the image quality. ^^ And I know they look fake but I did NO retouching at all to these pics, just light adjustment and adding the watermark. The lenses just give that glossy look! And one more to show it in different lighting. I was standing closer to my floor lamp. See how bright and sparkly it is? It's a lovely effect. Every purchase of a pair of circle lens will come with 1pc cutie animal lens case (worth $3.99), 1pc Collagen Eye Mask (worth $1.99) PLUS a chance to win a Happy n Co circle lens traveling kit (worth $8.99). Every day we will choose 2 winners randomly to get Happy n Co circle lens traveling kit. Winners will get their FREE kit with ordered sent together. Every pair of circle lens purchased will get a chance on this lucky draw, the more you purchase the bigger chance you would win. Hope you all have a lovely holiday week and I'll be back soon with another lens review! Those contacts look great on you! 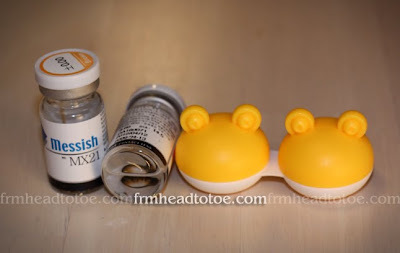 And how cute is that contact case?! Thank you for posting these in your blog! They look great on you =) You are a stunner! Sad panda, for those of us who HAVE to wear contacts, this is not for us, right? Another reason for me to get that PRK surgery done! Hmm yes, these lenses look very nice on you. Super cute case, and nice new haircut! Which picture did you end up bringing to your hair stylist? They invented a special camera to shoot Avatar in 3D and it is soooo worth it. I can't imagine seeing the movie any other way. I'm hoping that this is the gateway to a whole new category of movies of such stunning 3D quality. Yay for the new Canon XSI (I got one for my bday too, haha)! Those circle lenses are really sparkly, and the case is adorable. How do they feel comfort wise? The ~sparkling~ is kind of creepy. I like the color, but the sparkling is a turn off for me.. as if circle lens isn't already creepy enough. those contacts look so pretty on you! btw, i just saw avatar in 3D today! it WAS really beautiful. it must've taken so much time and effort. i read somewhere that it was the most expensive movie to produce. it was worth it! KeysGoRound: Krystal, circle lenses do come in prescription for vision correction. I believe there are even a couple brands that make toric lenses too, if you have astigmatism. Btw, my sister recently got PRK done and she has 20/20 with only slight blurriness from astig on one eye. She had REALLY bad vision before, like legally blind so it's pretty awesome! Alienman: I didn't even realize they did the movie in 3d without imax. Shows how much I know about movies. :P I agree though, I hope this is the future for movies because it was amazing! MilknCookiie: Yay for XSI! I still need to play with it and learn how it use it on manual mode but so far I'm loving it. :D I don't know about extended comfort but for the short amount that I tried them on they were pretty comfy. No problems of wearing it for less than an hour. lol! Mary in Wonder: There are circle lenses that look pretty cool on lighter eyes but I would generally stay away from brown lenses. I've seen green and grey lenses look really cool on light eyes but circle lenses tend to have a large pupil hole so anything dark-colored will show up as a ring around your light-colored iris in the middle. Grey lenses with a dark outer ring look really amazing on light eyes though! Tabitha: I agree, it was worth it. I still can't believe how much expression they captured in the movie. It was sooo realistic! I have a question. Do you know where I can get shoes like these for people with size 4 feet? I'm loving the new camera quality! When I was deciding on which camera to get this past summer, I was actually going for the XSi too, but ended up getting the D60. What lens are you using? I don't get why Asian girls are so obsessed with changing their eye colour. No other race is THIS obsessed!!! What's wrong w/ black eyes? MERRY CHRISTMAS JEN :) you're beautiful and I hope this Christmas is filled with love, laughter, cheer, and joy. Not to be insulting or anything because your pictures before weren't bad at all BUT with your new camera, your blog just feels complete. Your amazing genuine personality with amazing clear photos and informative posts makes this the perfect blog to read now. I have the XSi and I wanted to get the 50mm 1.8 but I read reviews that the build quality is very iffy. Some people had the thing break apart on them and they couldn't get it off their camera. Be careful. Did you use the kit lens or the 50mm for these photos? I can't wait to see more photos from you. I have a feeling with your creativity, the photos would be amazing. omg i saw avatar in 2D and i fell in love so im planning to go watch it in imax 3D too! it was just so great! I love the color on you! I just looked at the website and I was wondering what the power was? Love those lenses!! They look awesome on you! I'm considering buying them, but just one question... is the pattern wide enough so you won't get any blurrinness? Hi Jen, I am deciding on purchasing circle lens. I noticed that you said that the Dueba Big DM23 don't give you that blurry-ness.. I have that problem in the basic circle lens, too. I'm trying to pick between the Big DM23 and the Dueba Celeb's. Do the Dueba Celeb lens' give you a blur? I was thinking about purchasing these in grey but I noticed the base curve as 8.6. Would it be okay if my base curve is 8.8?